Blogging has been a source of inspiration for me. I truly believe I paid off $89,000 of debt because I started this blog. I’ve also met many “blog friends” who inspire me to grow my business every day. I learned about the below tools from them and I’m so glad I learned when I did. 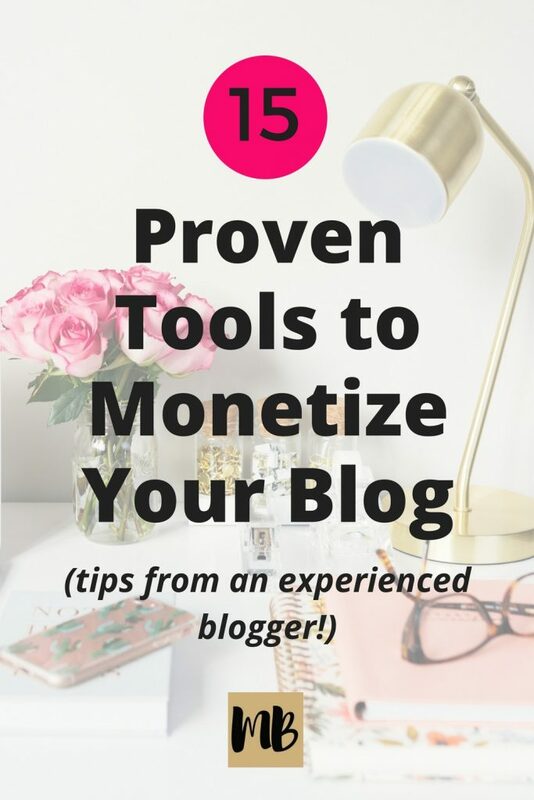 Below are the tools I wish I used on my blog from day one that will help you monetize your blog. At first, I was too cheap to pay for some of these products but once I loosened the grip on my wallet, I saw much more success on my blog. 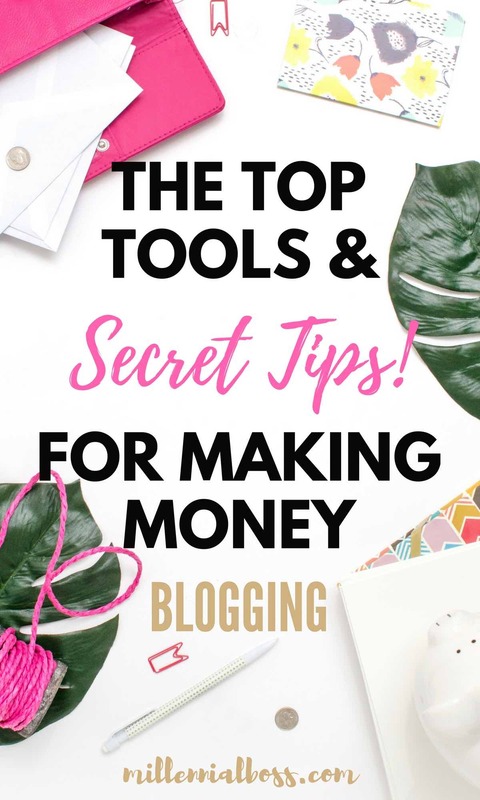 Most of these products are under $30 a month and can make a huge impact on your traffic and ability to make money blogging. -> If you don’t yet have a blog, you can start one with Bluehost. You can pick your domain name and sign up for cheap hosting in 15 minutes. -> I also wrote the How to Create Your Own Site Guide to help you get going. So how do I monetize my blog? Set up email marketing campaigns so you can collect emails from day 1. I missed out on so many opportunities to connect with my readers by neglecting to capture their email addresses from the beginning. I also just switched to ConvertKit from Mailchimp and it truly is in a league of it’s own. Pro Tip: Send an email at least one per week to your list. If you get unscubscribes after you send an email, don’t worry – you didn’t want to pay for them to be on the list anyways! It’s $29 through 1,000 people and then you pay $40+ as you get over 1,000 people on your list. How do I make my blog look professional? You can choose a free theme but after spending hours fiddling with my blog, I highly recommend spending the money for a premium theme. Premium themes are so much easier to set up and look more professional. I just switched over to the Genesis Studiopress theme and love how my site looks now! Plus, the StudioPress online tutorial makes it really easy to set up and customize your theme. I’m currently using their WellnessPro theme. This site uses the Wellness Pro theme from Studiopress. A more custom and cuter looking theme can be purchased from this other company (it’s where the Young House Love blog got their theme). Create beautiful images to make your site pretty and professional. Download stock photos from the internet and then upload to PicMonkey to add your own branding and logos. The better your pictures look, the better your site will be perceived, and thus the more sales you will bring in. Check out this post for a list of free girly stock photos. The downside of using free photos is that many other bloggers will use these photos so it’s harder to brand your images. I also recommend SC Stockshop and Ivory Mix for high-quality, paid stock photos. These companies aren’t that expensive and your brand can stand out. They also offer lots of vertical photos with whitespace which are perfect for Pinterest. It will be harder to find these type of images on free photos sites. With IvoryMix, you can get bundles for only $10. How much traffic do I need to monetize my blog? You don’t need hundreds of thousands of page views but I noticed that I was able to monetize a post when I got at least 1,000 page views to that post. If that seems far off for you right now, don’t fret. I spent $32 on this ebook and it’s seriously the best purchase I’ve made in awhile. Carly, the author of the ebook, makes thousands per month from Pinterest traffic. My favorite thing about this book is that it explains to you how Pinterest works and how to optimize your pins (including how they should look, what they should say, etc.) to increase traffic. You won’t be disappointed. Check out Pinteresting Strategies. I now get tens of thousands of page views per month from Pinterest. Prompt readers to share your content by including Shareaholic social share icons in every post. I like Shareaholic better than the other plugins I’ve used because they have tons of customization options, the icons are cute, they offer Tumblr, Reddit, and other social media platforms, and they have the “sharing is caring” message which draws the reader’s attention. Shareaholic also has a setting where you can enable related content to appear at the bottom of every post. You can enable content from around the web along with your own content and get paid! Plus, Shareaholic is free! Schedule pins ahead of time to drive thousands of Pinterest users to your site with little effort from you. The top bloggers are scheduling 100+ pins a day which is hard to accomplish without a tool. Pinterest seems to be the best traffic driver in social media right now. For example, this post on saving money received over 8,000 views in two weeks because it went viral on Pinterest. Tailwind is worth the money. I now receive 50,000 page views to this site a month – the majority of which come from Pinterest. Update September 2018: The Tailwind Tribes feature is INSANE for bloggers as well as their Instagram scheduler feature. My Instagram engagement increased 50% and Tribes has expanded my Pinterest reach to 5.3M. Tailwind is a no-brainer for any blogger in the game right now. Here’s a free credit for Tailwind. Above is an example of a Pinterest pin that I created. As much as you can invest in tools, keep in mind that the quality of your pins matter. Practice, practice practice and your pins will get better with time! I make mine in picmonkey. How do I actually make money blogging? Sign up to be an affiliate and when you review products in posts, make commissions on the sale. I am an affiliate with these three companies and highly recommend signing up for them. It’s free to sign up and once you sign up, you can see all of the merchants that offer affiliate links. Pretty much every category of company you can think of is on there from finance to fitness. You can choose to promote products through text links in your post or banners on your sidebar. For example: let’s say that you LOVE your new pair of jeans from Nordstrom. Sign up to be a Nordstrom affiliate, write a post about it and link using a link from Flexoffers. Also, create a disclaimer page. Last, focus on increasing traffic with Google & Pinterest before doubling down on increasing income. Traffic is key to income. I just finished the Making Sense of Affiliate Marketing Course and highly recommend it to anyone who wants to make money on their blog. 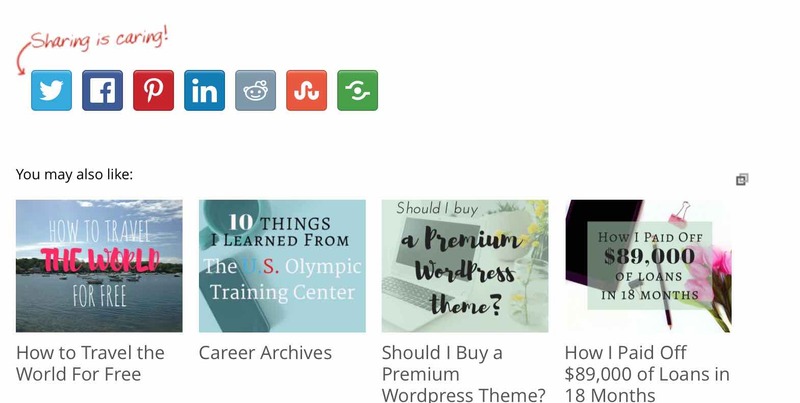 Michelle Schroeder-Gardner is the creator of the course and famous in the blogging world for making tens of thousands of dollars a month through affiliate sales. Her most recent income report broke six figures. Check out the online course which takes you step by step through the process of setting up and executing on a successful affiliate marketing strategy. I made my first dollar on the blog shortly after starting this course and it blew my mind. I was so happy! The course also gives you access to a Facebook mastermind group where hundreds of bloggers ask questions and help each other out. I post a question at least once a week and have been so impressed by the generosity of Michelle and the other bloggers in the group. You think other bloggers would be competitive and not want to help each other but it’s not like that at all! Everyone is so nice and supportive. Here is my review of the course if you want to learn more. I’ve earned over $12,000 from affiliate marketing so far and owe it all to this course. How do you make affiliate links? No one is going to click on your affiliate link if it looks like this: sale.com/asdkgsdghdskhgsd.sjklsdgs#54694= Unfortunately most affiliate links look like that in raw form. Fix that problem with the free Pretty Link plugin! All you have to do is paste your affiliate link and then type in what you want the link to look like and your link is created! Pretty Link let’s you group your links by category so they are easy to find. You can also choose “no follow” as a default setting which is super important to set so that you don’t get penalized by search engines. See below image for an example of what the Pretty Link plugin looks like. The true value of the Pretty Link plugin is that you can change your affiliate link across all posts and pages on your site with one update. For example: Credit Sesame is a free app I use to check my credit score and I promote that company on this site. Today I realized that the FlexOffers payout for a Credit Sesame signup is almost two dollars higher than the affiliate company I was originally promoting Credit Sesame through. I decided to switch and promote Credit Sesame through FlexOffers. If I didn’t have Pretty Link, I’d have to go find every post and article that has Credit Sesame links and update to the new link. Now with Pretty Link, I can update all in one place. Pretty awesome! My site was hacked last weekend. My homepage was replaced with a line of text saying “Hacked By Dark Ghost.” I started freaking out that google would blacklist me and that I would lose regular readers. A blog friend recommended Sucuri to me and I jumped on it. The price to fix my site was steep but still 1/3 of the price that was offered by SiteLock. Sucuri communicated with me the entire time while they were cleaning up the malware. Within 24 hours, it was resolved. I highly recommend signing up for Sucuri. Don’t let a slow site keep you from making money! I discovered Pingdom and now use it to monitor my website’s speed. It’s free and all you have to do is type in your URL to see the speed breakdown. 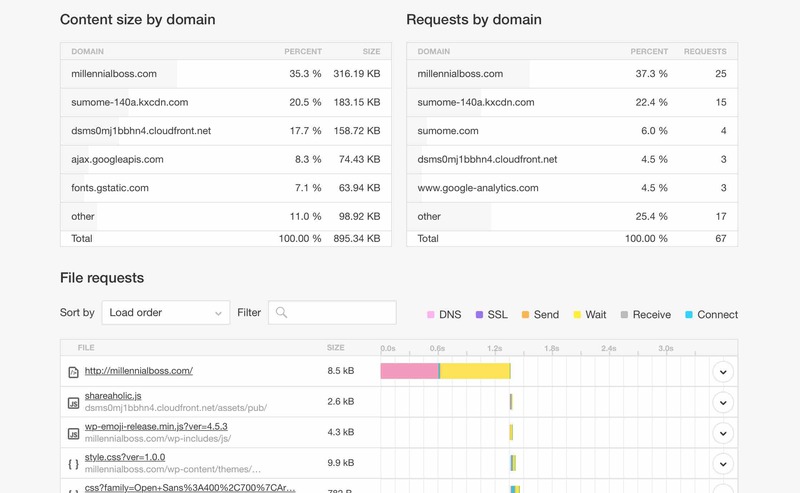 What I like about Pingdom compared to other sites is that you can see exactly where the slowness is coming from. Whether it’s an image or a plugin, you will see the breakdown. Here is a screenshot of what Pingdom returns when you enter my site’s URL and you can see the level of detail I’m talking about. Just a tip – if you have a favorite blogger and want to see what plugins they use on their homepage. Enter their URL on Pingdom. That is actually how I found out about the Shareaholic tool I mentioned earlier! PRO TIP: Images must be under 200KB or they will load slowly! Podcast App: I love podcasts and listen to them regularly. My favorites are Side Hustle Nation, Smart Passive Income, Radical Personal Finance, Afford Anything Podcast, and The Financial Independence Podcast with the Mad Fientist. I was recently featured on an episode of the Mad Fientist Podcast. I’m so excited since I’m such a big fan! Notes App: This app is more of a social media tool for me. I use the notes app to write my instagram bio and hashtags. Instagram doesn’t allow you to write multiple lines in the bio, except when you copy it in from other sources. It’s also 100x easier to write all of your hashtags out at once in Notes and then paste in to every post. Simple Hooks and Simple Edits Plugins: These plugins allow you to easily customize your site without having to go into the code. You can add banners or an affiliate disclaimer to the top of every post with these two tools. Google Analytics: I check my sources of traffic on Google Analytics almost daily. Specifically, I look at where my traffic comes from (organic, pinterest, referrals, etc.). I also look at what posts are more popular than others. If a post is going viral, I optimize that post for affiliate sales. Read the Millennial Boss blogging posts & income reports for more ideas. Great list, thank you for putting everything together! I just bookmarked this page to come back to it again 🙂 I’m going to use shareaholic on my blog now. Glad the list was helpful!! These are fab Julie! Have you had a site design change? Looking fab! I use Shareaholic, and I LOVE Picmonkey. I find it so easy to use. Thank you! I gave my site a complete makeover! Glad you like it!! Totally bookmarking this post! I’ve been using a different sharing plugin, but I much prefer the look of Shareaholic’s icons that I’ve seen on yours and other blogs. I never knew which plugin it was, but now I know. Still using Mailchimp though since I’m still a newbie. Gotta go check out the rest of your recommendations. Thanks Julie! Glad you liked the post! Totally agree on the look of Shareaholic’s icons versus the others! Much better looking! LOVED this post, we do some of those, but others may be very, very useful to consider. Will be saving this post to come back to! Thanks, Tristan! Glad the post was helpful! I just downloaded Shareaholic and am in the process of getting it set up. These tips are great! Pinning it to keep for reference as I improve my site. Thanks, Amanda! Glad these tips were helpful! Shareaholic is GREAT! Hi Julie, I just started using Shareaholic a few weeks ago and love it. Thank you for the podcast suggestions going to look those up today. Love your blog like the others bookmarking and will share. Interested in checking out the plugin Simple Hooks and Simple Edits. You’re welcome! I love those podcasts. They’re so helpful for financial advice! Awesome list. As a new blogger, it can be hard trying to figure out what to do/how to make things work. I really like your list and I took notes from it! OMG so many new tricks of the trade! Thank you for sharing! I’m going to look into these options asap! Good luck! I hope it does! Julie, this is an excellent article. In my opinion every new blogger should read it before start blogging. Although I would not recommend all the tools you have mentioned, it is still a great resource for beginners. I bet you have spent a lot of time putting it together. Good job!